Every moment counts, every decision matters, every act has consequences. 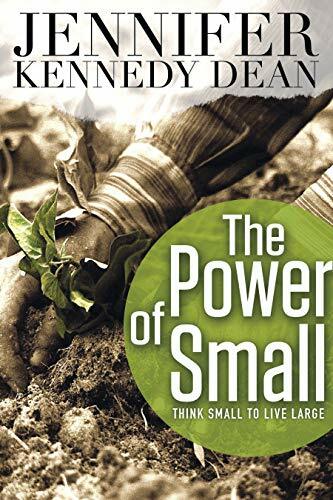 Through this 28-day experience, respected author Jennifer Kennedy Dean shows how all big things start small and how a life of obedience is made up of one small obedience after another. Small decisions ultimately affect the outcome of major events. Some insignificant and random event, in retrospect, is pivotal. Each day includes a devotional thought from Scripture on the power of small; a story, either from Scripture or a testimony, illustrating the principle; and a challenge to one small change today. Jennifer Kennedy Dean is executive director of the Praying Life Foundation and a respected author and speaker. The author of numerous books, studies, and magazine articles specializing in prayer and spiritual formation, her Bible study Live a Praying Life®! has been called a flagship work on prayer. Widely recognized as an unusually gifted communicator, Jennifer speaks all over the country calling God’s people to discover the difference between a prayer life and a praying life. Jennifer is the author of such books as Clothed with Power, Set Apart, Power in the Blood of Christ, Power in the Name of Jesus, Altar’d, and Secrets Jesus Shared. A highly demanded speaker, her engagements include respected organizations such as the Billy Graham Training Center at the Cove and Focus on the Family. She is a board member for Advanced Writers and Speakers Association, a member of America’s National Prayer Committee, a member of National Professional Women Association, and national prayer director and board member for Christian Women in Media.